I had to take advantage of the tomatoes that were still at the farmer’s market this chilly weekend. Also, I picked up some eggs from Grazin’ Angus Acres stand. They are a farm in Ghent, NY, and their eggs have the “Animal Welfare Approved” sticker. Not only are the chickens a lot happier than your typical chickens, but the eggs really are delicious as well. I didn’t have any curry powder on hand, so I mixed the following spices to make my own version of pseudo-curry powder: red pepper flakes, turmeric, yellow mustard seed, brown mustard seed, coriander, hungarian paprika, cumin, and cloves. Also, I used the egg-poaching advice from Smitten Kitchen and it worked out well. Thanks to Cooking Light for this recipe! Combine first 3 ingredients in a large saucepan. Bring to a boil. Cover, reduce heat, and simmer 20 minutes or until lentils are tender. Drain; discard bay leaf. Heat a nonstick skillet over medium-high heat. Add oil to pan; swirl to coat. Add onion and tomato; sauté 8 minutes or until onion is tender. Add curry, cumin, 1/4 teaspoon salt, red pepper, and garlic; sauté 2 minutes. Add lentils; cook 1 minute. Remove from heat. Add water to a large skillet, filling two-thirds full; bring to a boil. Reduce heat; simmer. Add vinegar to pan. Break eggs into custard cups. Gently pour eggs into pan; cook 3 minutes or until desired degree of doneness. Carefully remove eggs from pan using a slotted spoon. 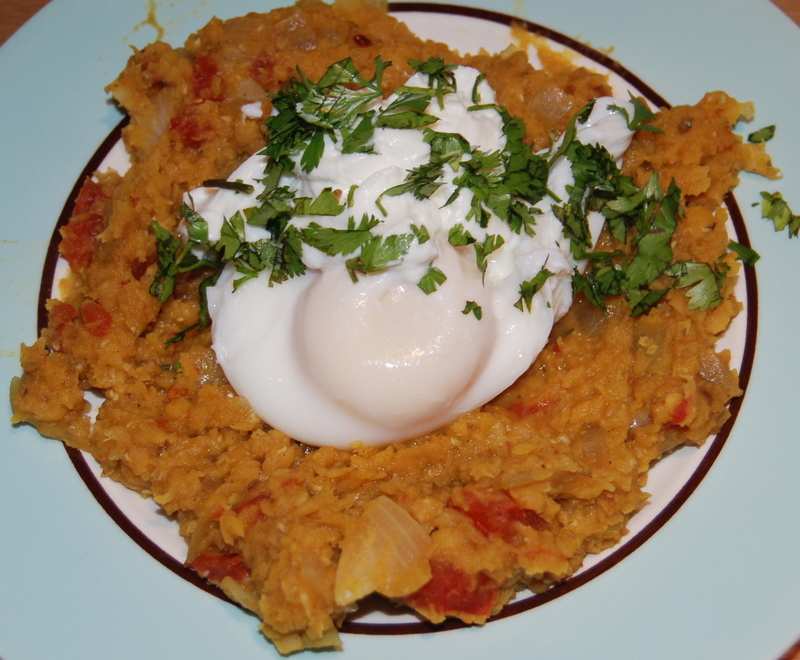 Place about 3/4 cup lentil mixture on each of 4 plates; top each serving with 1 poached egg. Sprinkle evenly with remaining 1/4 teaspoon salt and black pepper. Top each serving with 1 tablespoon yogurt and 1 1/2 teaspoons cilantro. Cue the old school Zelda theme song, because I’m on a quest: make a canning salsa that is spicy enough for my husband to enjoy the heat all winter long. This recipe came from the Food Channel. The result is a salsa with a decent amount of spice (but my quest is not over yet). I know that I can just add some habaneros for some serious heat, and that would be great for a salsa to stick in the fridge and eat within the week. However, whenever I want to put tomatoes in the cabinet for a year, I am wary of playing with the ingredients. That’s because I know that it has to have the correct level of acidity, etc. in order to avoid spoiling the food. 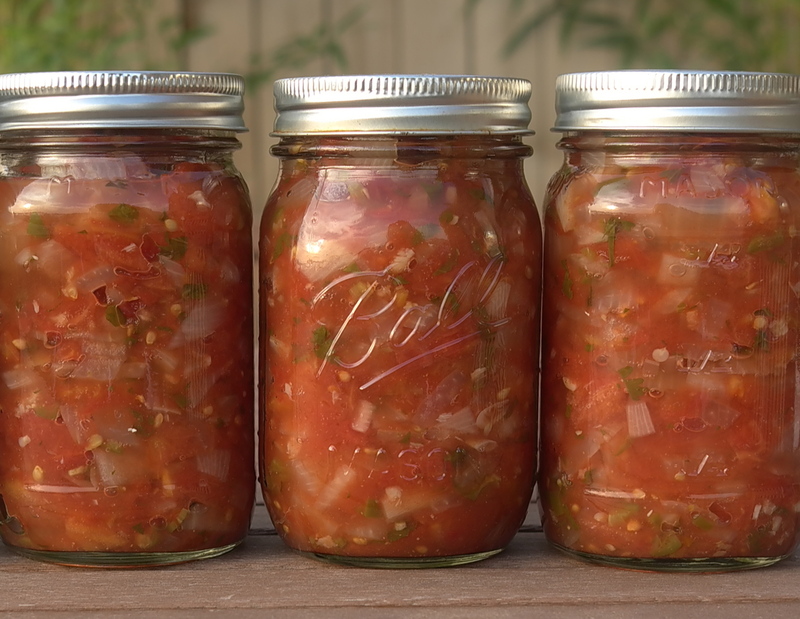 Does anyone out there know of a tested recipe for a spicy canning tomato salsa? I think there are a still a few weeks left of tomato season, and I would like to give it one more try. That being said, this salsa is fairly easy and pretty delicious. Adjust the number of jalapeños, or take out some seeds if that’s your preference. This recipe could also use a bit more salt, but I would taste it first and decide what you want to do. These tomatoes came from a farm stand in Amagansett, and the jalapeños came from the rooftop garden. One more note: My makeshift canner holds 4 pint jars at a time. I only processed 4 jars and put the other two directly in the fridge. Then when I noticed how the salsa wasn’t salty, I started to doubt that it would stay good in the cabinet. The next day, I noticed some air bubbles in a few of the jars, so I decided put three more in the fridge. I didn’t want to take any chances. I only have one jar left in the cabinet. I will open that one in a few months and let you know if it worked. Put clean tomatoes in boiling water for 30-45 seconds, and then plunge them into ice water. The tomatoes will be easy to peel as a result. Peel tomatoes and cut out cores or bad spots. Chop the tomatoes to desired size (they will cook down so leave them slightly larger than you want them to be in the salsa). Mix tomatoes, garlic, lime juice, salt, and cumin and bring to a boil. Add onion, peppers, and cilantro. Bring to a boil and then simmer for 7-10 minutes. Remove 1 cup of liquid (to thicken the salsa). I did not do this, but I will next time: Use a chopstick or knife to slide around the jar to get rid of air bubbles. Wipe the rim of the jar, place sterilized seal on jar, and tighten the ring. Place jars in water bath for 15 minutes (time depends on altitude – more time for higher altitudes). Remove jars and let stand for at least 24 hours. Remove rings (optional) and store. If the jar did not seal, place it in refrigerator and use within a week. 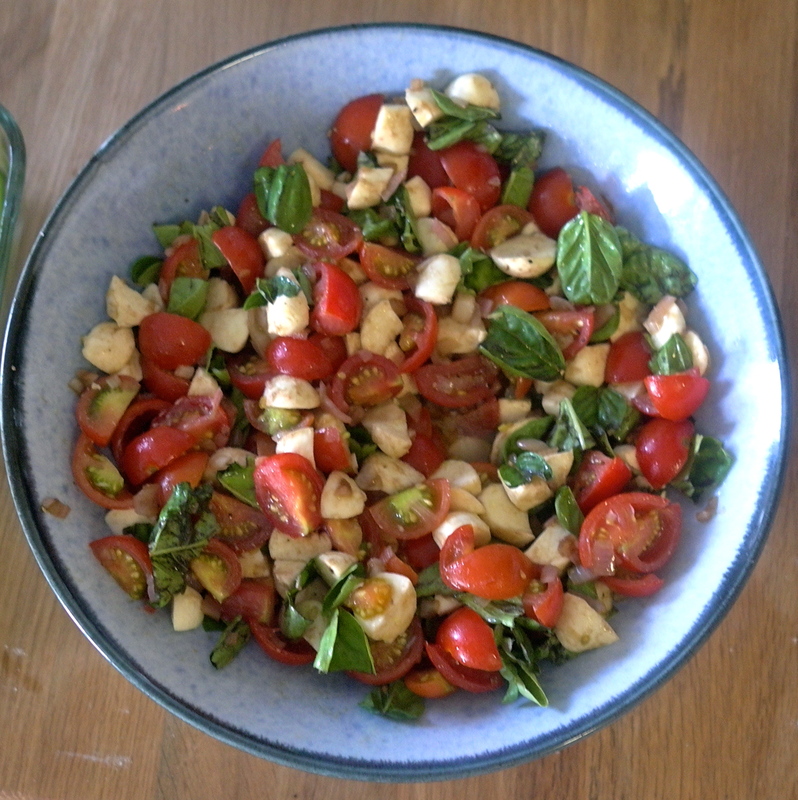 Here’s another version of the classic Caprese salad. This one takes a little bit more prep work than the original post, and it’s a welcome variation because you can eat this one without a knife. Sometimes, the fewer utensils the better, especially when having to carry everything up and down a spiral staircase. 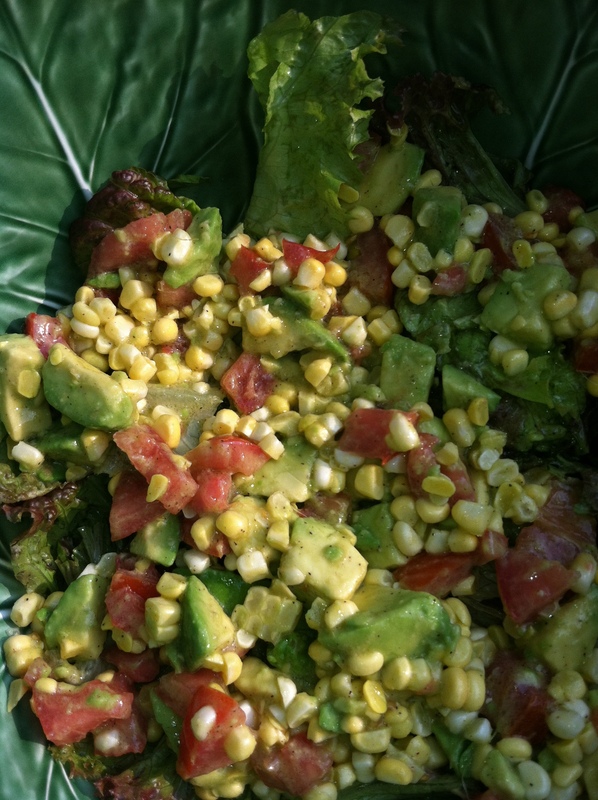 This is a delicious side dish for a summer BBQ. 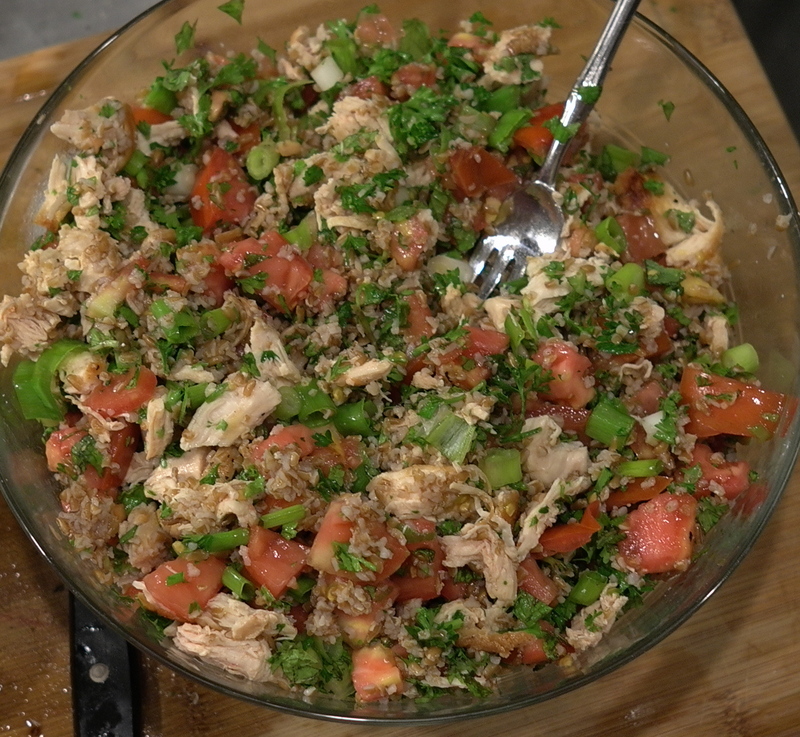 To make it a hearty main dish, you can add couscous or quinoa and some toasted pine nuts. The cherry tomatoes and basil came from my garden in the sky. I was pretty excited that I grew enough tomatoes to make a salad that fed 5 people! 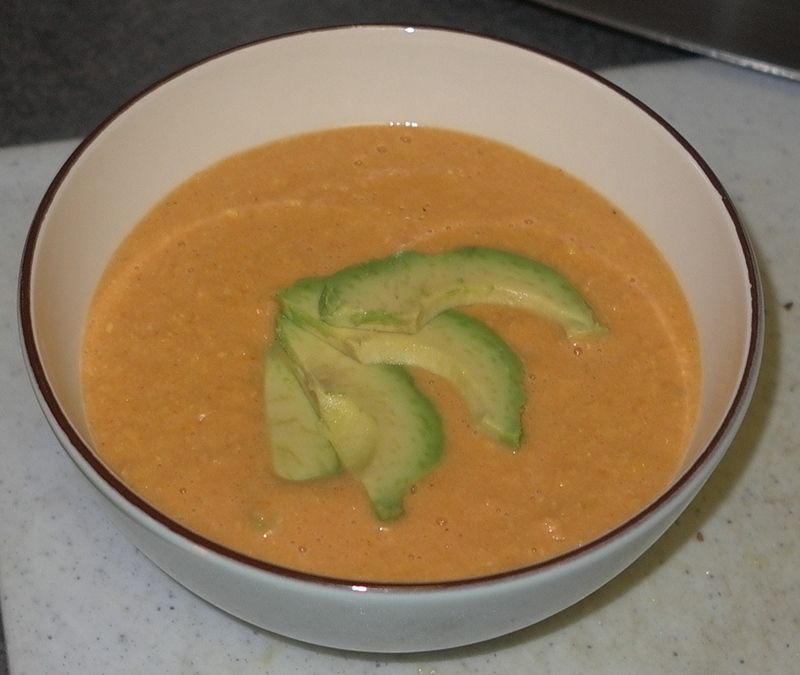 Thanks to The Curvy Carrot for this fantastic recipe. 1. Toss the tomatoes, 1/4 teaspoon of salt, and the sugar in a medium bowl. Set it aside and let stand on its own for 30 minutes. 2. Transfer the tomatoes to a salad spinner and spin them for a few seconds to remove the seeds and extra juice. Make sure you conserve the juice. 3. Put the spun tomato juice/seeds through a fine strainer to reserve the juice and discard the seeds. 4. Heat a medium saucepan over medium-low heat on the stove. 6. Transfer the mixture to a small bowl and cool to room temperature. 7. Whisk in the oil and salt and pepper to taste. 8. Add the basil and the mozzarella to the tomatoes. Toss gently to combine. 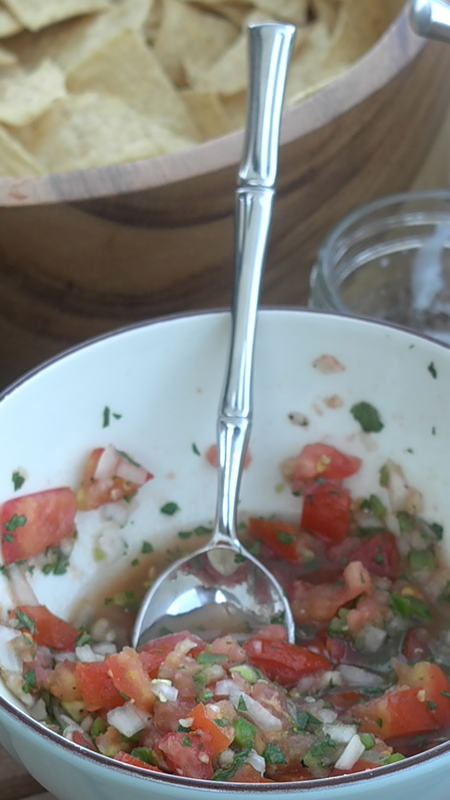 Here is a fresh salsa recipe starring ingredients from my rooftop garden! I used Better Bush tomatoes (Bonnie) which are good for containers. The jalapeños that we’ve been growing are varying in their heat factor. My husband has the job of tasting the spiciest part of the jalapeño: I cut off a small slice closest to the stem and keep the seeds in it. That’s the part he tastes. Then, he rates them on a scale of 1-10; 10 being a very spicy jalapeño, 1 being no spice. This happens before I add the pepper to recipes so I can decide how much to add. This one was a 4. I still have not figured out why some are hotter than others, but I’m glad to have a spice tester nearby. Right now, there are a bunch of green tomatoes and baby jalapeños on the plants, so there is definitely going to be more experiments with salsa in a few weeks! Do you have a favorite salsa recipe? Maybe you like to add peaches, corn, or black beans to yours? Please send it along! Combine all ingredients. Refrigerate for a few hours before serving.